Each patrol was tasked to create a holiday theme dessert for a daring panel of judges. The Hydras created a Banana Split with Holiday Sprinkles, the Bacon Ninjas created an Oreo Mint Pudding, and the Invisible Monkeys Created a Blackberry Slump. 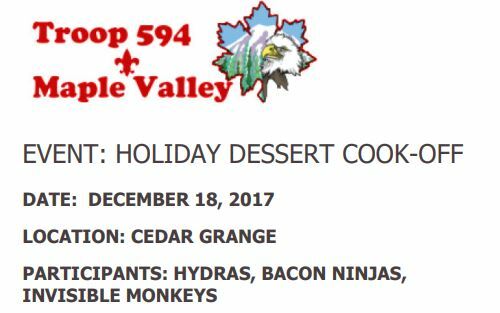 While the scores were very close, there are actually a tie, the tiebreaker went to the most flavorful dessert – Congratulations to the Hydras for the winning Dessert a Holiday Banana Split. Thank you to the following judges: Katlin, Terra, Jill, Andrea, Lisa B.